Fantasia: An Algerian Cavalcade is not a novel, or a memoir or an oral history, though it shares characteristics with all three genres. It's a piece of literature that defies easy categorization. 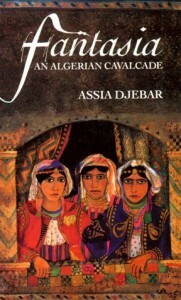 It is, perhaps, best described as a meditation on history (Algeria's in this case), alienation and women based on sources from both the French and native sides of Algeria's recent, tragic history, including the author's own experiences (she fought in the last rebellion that ended in Algeria's independence). There are passages that are intensely interesting and even moving; the reader gets swept up in Djebar's world but then she drops into an off-putting, deconstructionalist voice that threw me entirely out of the book. I would have enjoyed it more had she not found it necessary to pull back from the immediacy of the narrative to beat me over the head with its meaning. Djebar should have had more confidence in her audience, or put the metafictional part of her musings in a separate context. I'm on the fence still with Assia Djebar. I'm impressed enough and respectful enough of her writing to be interested in reading further but I'm reserving a final opinion.